Converting .shp into .gpx using QGIS? I would like to convert .shp into .gpx. creation of field ObjectId failed (OGR error: Field of name 'ObjectId' is not supported in GPX schema. Use GPX_USE_EXTENSIONS creation option to allow use of the element). or check "skip attribute creation" underneath (or what it is named in your language). to get tracks instead of routes. As indicated above. However, if you don't understand or manage your projections, then you will run into additional problems. 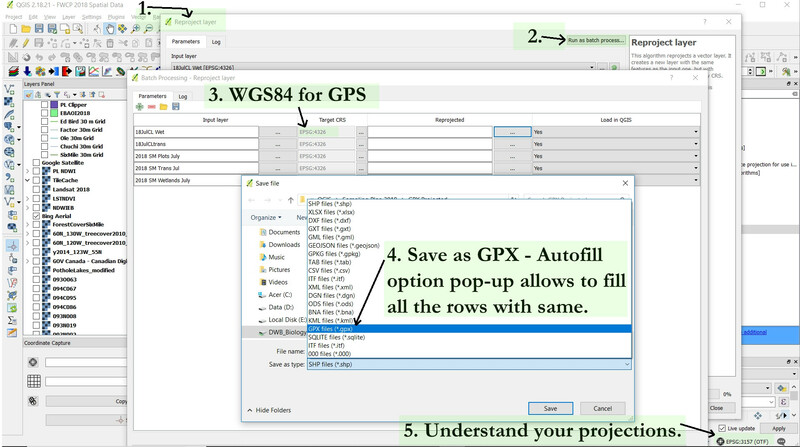 You will find errors in the data - imprecision in the points or tracks if your CRS is different from what your shapefiles are projected in or how your workspace is projected; WGS84 is needed for GPS units. The best solution I have found is to select "Reproject layer" from your processing toolbox. This gives you the option to batch convert multiple layers, reproject the data properly, and save as a gpx file. The only issue that I haven't learned to solve is how to retain the labels. I'm hoping that someone might know how or have a trick to do this - it doesn't seem to be an option. I have had to either use the clunky Garmin BaseCamp software to click and revise the labels individually or go into the gpx code and type in the code manually - both are time consuming. Not the answer you're looking for? Browse other questions tagged qgis shapefile gpx or ask your own question. How to keep the ids of way points of a shapefile when I convert it to a GPX file in QGIS? How can I export a linestring to a GPX file in QGIS? How do I convert a GPX to SHP with extended properties? How to rename fields from postgis when using ogr2ogr to create a GPX file?